J'adore premium albums & why you need one! After many years of trying different companies to supply our Wedding Albums, We have found the ONE!! We absolutely love these albums, We have been asked what the process is for putting a album together so here is a basic guide. Within a few weeks of your wedding day, we present to you a digital version of your album with basic editing. From there we can make adjustments add pages etc, This is generally better if you can come into the studio but can also be done online. From there your changes are made and images fully retouched then completed and design sent of to Italy!! For those that have booked the premium combo it includes our 12x8inch album which is valued at $600 and the large option is which is 14x10 requires a $600 upgrade, then advancing to our 16x12 which is $995 to upgrade. All of our albums also include the box pictured below. You can purchase these upgrades either before or after the wedding. There are several options for you to personalise your album including colours, textures, ribbons and engraving, which we can do in person after the wedding or via video Skype. In regards to selecting the images for your album we have had the pleasure of designing many albums, so we have a good feel for what most people want included, If there is anything specific extra that you want us to add feel free to let us know at any time along the process. Our base album includes 20 pages or 10 spreads as they are called. Often when designing we add more pages if we think it needs more we also do this so if you want to re-design and decide what images to keep, remove or swap. It is a lot easier to remove images and pages rather than sort through the 1000+ and add. Extra pages can be purchased at $50 per page, there is no obligation to purchase anymore than the 20 pages it is purely there as a option. One of the major bonuses to getting an album is all images that go into the album will get extra attention in photoshop if needed, for example body shaping and skin retouching. Some people say that printed photos are outdated in the modern world of technology. However, many forget about an essential thing for human beings - an ability to touch and hold a material memory in their hands. Every page of the wedding photo album is a real and sizable moment of time with happy smiles of your beloved one, the smell of flowers and warm family wishes. 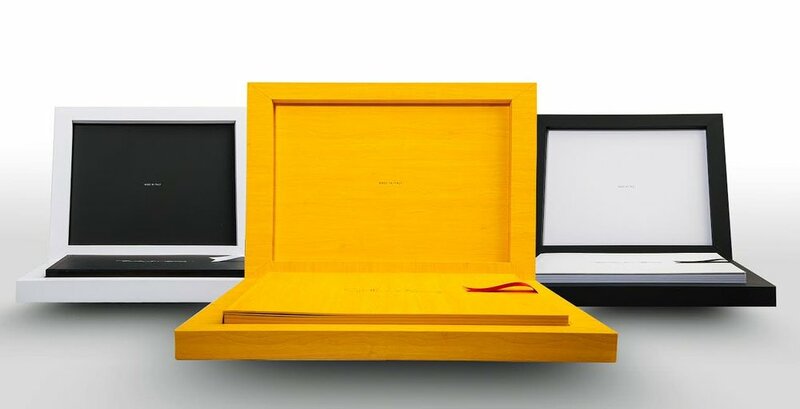 There are many reasons why you should order your wedding album, but we chose for you the three most important points. The wedding album is an artwork made especially for you, featuring your couple’s personal style and reflecting the mood of your wedding day. It is made as a romantic storybook that page by page opens the brightest moments of your touchy wedding ceremony and your fun party, sharing your love with anyone who sees it. The album is one of the first common belongings of the new family and an artifact that carries your tradition to the next generation. Every anniversary celebration becomes more romantic when you open the pages of the happiest day of your lives. Digital photos may get lost, devices can run out of order, but the oldie-goldie printed photos, carefully chosen and artistically put into a particular order, will become handy every time you want to dive into your sweet memories or share them with your guests. Paper album is never old - professionally made, handcrafted, it remains a trendy and must-have wedding item in any epochs. Just flip the page, inhale the smell of the fresh print and travel back in time. Passing your album to your children, showing the life story of yours on paper is a very symbolic process. This is how you have learned the adventures of your parents, and this is what your kids will always remember - beautiful wedding album as a keeper of family history. Good-quality albums will stay in a great condition for many generations, transferring not only photos but your emotions, feelings, and experiences. Holding a unique handmade album with the precious wedding pictures in your hands is a magical thing. It is like keeping a priceless treasure, a fairy tale, that once became real. Love each other and preserve your beautiful memories the best way you can!